Spidey #1 review, spoiler warning. Reviews cut into reading time which is in preciously short supply these days so I will attempt to be brief. This review is for Spidey #1 from marvel. Possible spoilers past this point. I will now place a large picture between you and them. If you are a Spider-Man fan, yes this comic is for you. If you were kind of hoping and wishing that you could go back to the good old days when Spider-Man was in school and things were simpler, yes this comic is for you. 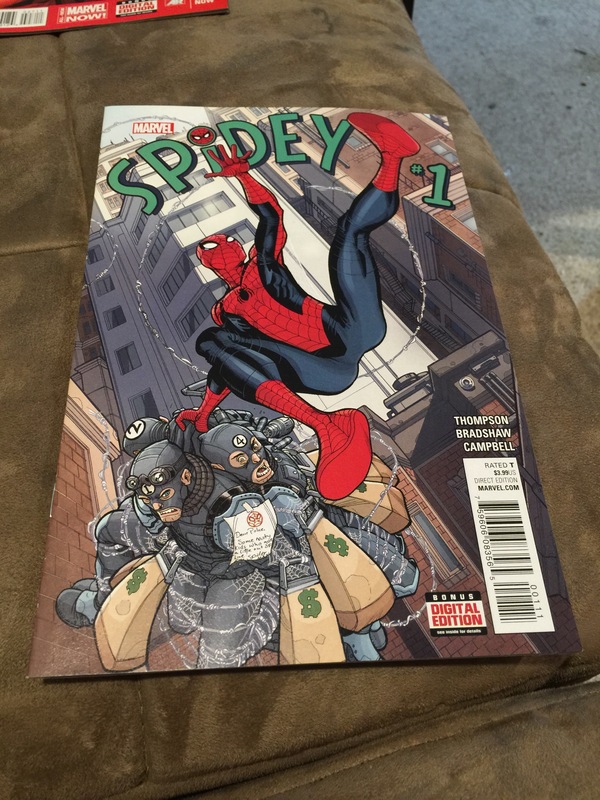 If you have grown tired of worlds where Spider-Man has other Spider-Men all the time and you want a comic that rehashes all the old school story lines, then stop reading this and go grab Spidey. I will be picking up the second issue tomorrow. Here come the spoilers. Gwen Stacy is alive, but that’s because we are basically back when. She’s not a super hero (as of yet), Flash Thompson isn’t venom and is still just a high school jerk. Spider-Man is just Peter Parker and to drive that idea home, Otto Octavious shows up havoc style just like the good old days. Norman Osborne still runs oscorp and kind of talks to a goblin version of himself in the mirror. Caveat? This is in modern times. People tweet about Spider-Man. It is not obnoxious like the current run of batgirl though. If you think this was spoiler light that’s because this isn’t a long read, it gets down to all that Spider-Man wise cracking we love and makes your heart burst with nostalgia.